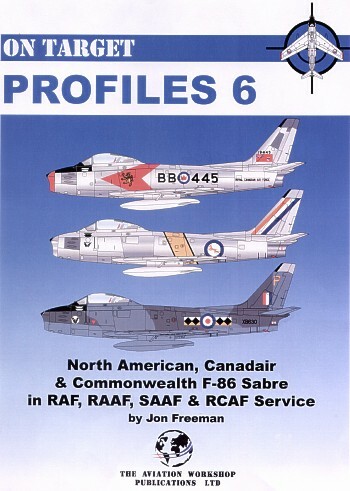 Advantages: Packed with attractive profiles; many and varied colours and markings across North American and Commonwealth variants in international service; detailed and useful captions describing ops, colours, markings and unusual features; specific references cited; great source of inspiration for modellers. The latest release in the Aviation Workshop Profiles series is North American, Canadair, Commonwealth F-86 Sabre in RAF, RCAF, RAAF, SAAF, Pakistani and Malaysian Service, by Jon Freeman. The title might be a bit of a mouthful, but the contents are very tasty and easy to digest! In common with earlier titles in the series, this book is crammed full of profiles of the subject - in this case 88 profiles of Sabres in the service of British and Commonwealth countries. 22 of the aircraft are depicted in four-view diagrams on a full page. Jon Freeman's artwork will already be familiar to many of HyperScale's visitors, and his work here is clean, clear and very attractive. At 44 pages (plus covers), this title also includes introductory text for each country, and five pages of colour photos. These are very helpful for modellers. The captions are usefully detailed too, covering colours, markings, operations and references. Aviation Workshop's "On Target Profile" series is an ideal format for modellers. In my opinion, these British and Commonwealth Sabres offer some of the most colourful and varied subjects of any single military aircraft type. On Target Profiles 6 is another terrific title that will provide plenty of inspiration for modellers. There are plenty of available kits and conversions for each Sabre variants too. Thanks to Jon Freeman at Model Alliance for the review sample.